Every year when we come to the time of Yom Teruah (aka Rosh HaShanah), I get into the discussion of what is the תרועה– Teruah which the Torah is speaking of. Though for many the argument has never been settled, I want to suggest a possible argument. The idea that a Teruah is a sound which originates from an instrument is well attested in the Bible, and is also well attested in Jewish practice in different communities. We even find the idea mentioned in the writing of Philo (About The Commands, book two). However, Karaites argue that the Teruah is the sound of people yelling/shouting, and they cite verses which demonstrate the word תרועה in the context of shouting. Because the command about this day is a very short one, and we do not have much to work with, a very detailed discussion is not always that simple. This reality has made the debate one of verse citing and word meaning. a. When looking at the appearance of the word תרועה in the Biblical text (36 times), we find that most (about 20–some can be argued) appearances of the word are in the context of instrument, and some cases can also be a mix of both instrument and voice. In many of the appearances the instrument is in cultic setting, which fits into a feast context. It is important to point out that books in the Bible have words which are used in specific ways, making it possible that the word Teruah is specifically used as the sounding of a Shofar. This is also the case for the book of Numbers, and by that includes the whole Torah. In this case any argument used from other verses in the Bible are subject to dismissal due to variation of word meaning which can happen between layers of Hebrew, and between books (Miller-Naude and Zevit, Diachrony in Biblical Hebrew, Winona Lake 2012). c. Yom Teruah is also a Rosh Chodesh (new moon), and it is well known that a Shofar was sounded during the new moon (Psalms 81:4). Philo in his commentary about the feasts clearly states that it is “The holy new moon” and “The day of Horns (Shofarot)” (Daniel Nataf, S. Writing of Philo, vol3 p.60-61 Bialik institute 2000). The overall context of a feast day (cultic setting), a new moon day, the context the of Teruah with instruments, and the recorded practice are in my opinion large enough evidence that the Teruah of this day is with a Shofar. What does a Teruah sound like? A well known argument in Jewish sources covers the subject of what the Teruah sounded like. Was it a grunt or was it a wailing sound (Babvli, Rosha Hashana 33b). Graphic description of what a Teruah sounds like from Seder Rav Se’adyah Gaon (Iraq 10th century). At the end it was decided that both sounds would be used, and now we have combinations which have a long sound combined with short “toots” in sets of 3 (Shvarim), and 9 (Teruah). 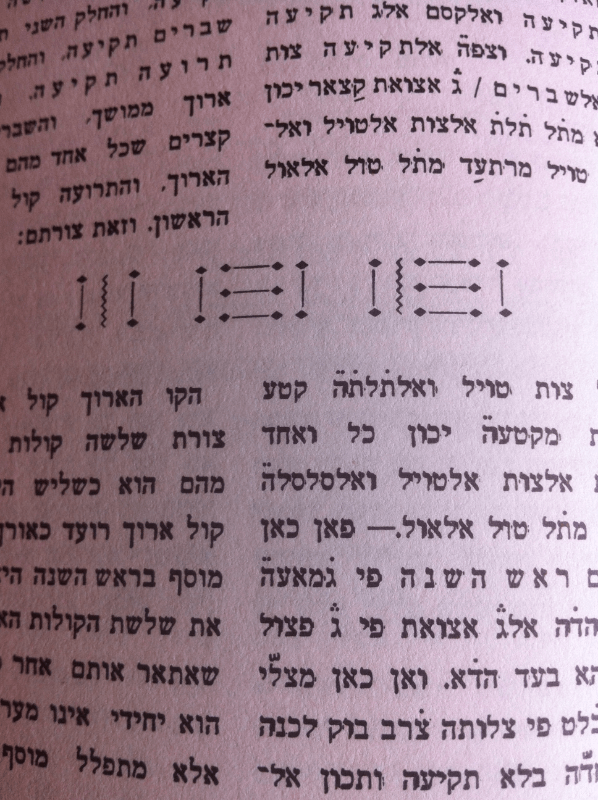 Description of what a Teruah sounds like from Sefer Hamanhig (R.Avraham Ben Natan of Lunel, Ashkenaz 12th century). The question which developed in time was “what was the sound of the Teruah part in this setting?”. Nowadays most people know the 9 “toots”, however this opinion is based on Rashi’s commentary on the Talmud, and is detached from the actual practice of Jews worldwide. When researching this topic I came across several graphic depictions of the sounds which clearly show a wave sound and not toots. When further investigating (interviews with community elders), I discovered that almost all Jewish traditions were originally a wave sound and not a toot. This was practiced by everyone, but nowadays only German and Yemini Jews keep to this practice.